Writing for movies and TV: Why do so many people want to be screenwriters? Why Do So Many People Want to Be Screenwriters? 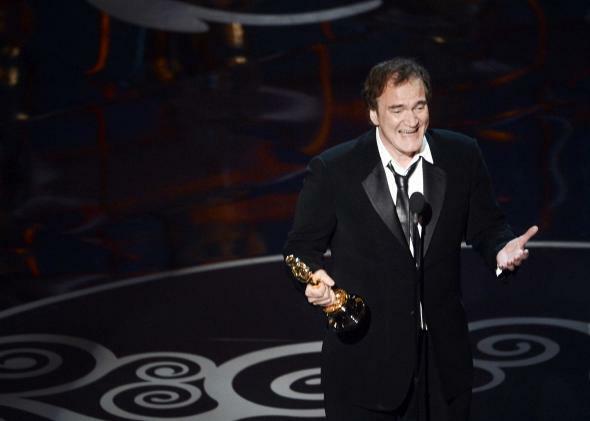 Writer/director Quentin Tarantino accepts the Best Original Screenplay Oscar for Django Unchained on Feb. 24, 2013, in Hollywood, California. Most of the civilized world as a whole is driven by entertainment. Two of the primary platforms of entertainment are television and film. Film and television lovers love film and television for a variety of different reasons. Those with creative minds may look at television and film as possible career platforms—how great would it be to work at something that you already love? Those individuals look to the films and shows they love and they see talented producers, directors, and actors telling great stories. In the credits, they see that these stories are written by writers. When they watch award shows, they see that writers are nominated for and winning awards for doing so. Or, since they are obviously film and television lovers, they read the entertainment magazines that have interviews with Hollywood talent. So, like anyone interested in any career, they are drawn to the thought of taking that on. Many then read screenwriting books from the secondary industry of script consultants, gurus, and sure, some writers with great credits and such. They are given “secrets,” “answers,” and “formulas” to success (except for great books like The Screenwriter’s Bible, How Not to Write a Screenplay, and others that teach the general guidelines and expectations). So those people begin to believe that they can make it happen. They find out that it’s not as easy as those books and seminars make it seem. They find out that having a “good idea” for a movie or television show isn’t enough. Then they find out that there really are no secrets, answers, or formulas for successful screenplays. There are only general guidelines and expectations (general format, general structure, general aesthetics, etc.) to start from, but those aren’t enough. They learn quickly (or all too often not) that it takes more than all of that to get into this business. And then they stop. Or they put it off. Or they find something better. Then there are a minority of those that, despite the hardship of writing screenplays, actually stick with it and learn how to truly learn. They watch and study movies, they read produced scripts, and they continue to write, write, and write. They fail time and time again, but learn from their mistakes. And their writing evolves. They study the business. They study the trends. They find out who are the power players and why. They continue to write and eventually begin writing scripts worthy of consideration. They may even win a contest or two or garner the attention of some powers that be. They continue to write and develop, chasing that dream. And then they stop. Or they put it off. Or they find something better. Because in the end, being a good or great screenwriter isn’t enough. The constant rejection becomes overbearing. They begin to have families. Their priorities change. They discover that they either don’t love it enough or they love their family more and need to provide for them through more reachable goals and objectives. But then there are those lucky few that continue on still. They discover that it’s not just about great writing. There’s so much more to making a screenwriting career happen. They learn that it takes networking. They learn that it likely means moving to Los Angeles. They learn that their beloved scripts are often calling cards to writing assignments and will likely never be produced. They learn that success in screenwriting often comes from the relationships that are made. They do what I did and take security guard jobs to get onto studio lots. Or they work at a studio store, or the mail room, or concessions, or janitorial, or maintenance. Or they drive cars and trucks. Or they work as assistants. They earn low wages to at least be on the playing field within reach of the powers that be and they wait for any and all opportunities to take advantage of. And then they stop. Or they put it off. Or they find something better. More often than not, they find different Hollywood jobs where they can make an honest and consistent living. Some stay in those aforementioned positions and move up through the ranks or they find something better. It’s a cliché in Hollywood that everyone in Los Angeles is a screenwriter. To much of a degree, this is true. Then there are those that discover that all of the above still isn’t enough. They get lucky and see that luck, as far as being at the right place, at the right time, with the right script, is actually how screenwriters find success. They get some assignments, maybe they sell or option a script of their own (hard to come by these days), etc. Yet they are still what I call blue-collar screenwriters, which means they aren’t earning the big paychecks that those books all so often talk about. Instead of six figures, they’re earning low five figures. But they’re damn blessed and happy to be in a position where thousands, no, tens of thousands, no, perhaps hundreds of thousands would kill to be in. Yet the work is sporadic at best. Despite hope to break into the top 1 percent earners who do make six figures and beyond, they all too often see a year, or two, or three, or more go by without another writing gig. And all too often, yes, they stop, or they put it off, or they find something better. They may still luck out and get some more work here and there, but they have to make a living elsewhere. And finally, there are those that do all of the above and have just a few more lucky moments than others. These are the screenwriters you’re often seeing in the credits for most major releases. Some are richer, more successful, and more revered than others, but they’re working in the show. They’re making a living. Those are the reasons why so many still try. Because it’s a dream. It’s a passion. For some, it’s fate. For others, it’s but a turn in an intersection of the long road of life, for better to try than to regret not ever trying. Screenwriting: Is writing overly romanticized as a career? Breaking into Hollywood: What is good advice for teenagers today who want to make and direct movies? Movie Business and Industry: What is difference between filming styles for TV movies and feature films?